For our proven Hapuflam®-Fire protection coating, we have developed a new innovative product: Hapuflam® - fire protection textile. The Hapuflam® fire protection textile is extremely tear-proof thanks to the glassfibre weave. Due to the net like structure, operating heat from electric cables can escape very well and therefore does not have additional insulation. The Hapuflam® fire protection textile sets new standards in preventative fire protection. Particularly due to the effect of the insulation layer formed by the building material, the fire protection cover prevents the spread of fire through the electrical lines (cables) and line systems (cable systems) provided with the fire protection cover in the event of the spontaneous combustion of electrical lines (cables) and line systems (cable systems) by short-circuit or overheating. The Hapuflam® fire protection textile is precaution for preventing the development of fire and preventing the transfer of fire through electrical lines (cables) or line systems (cable systems). The Hapuflam® fire protection range for preventative to fire protection offers you easy to install, special safety for your systems and buildings. 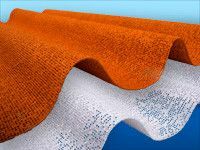 The way our Hapuflam® fire protection textile works is based on the formation of insulation layers. In the event of a fire or the effect of heat, a steady, heat-insulating, fine pore foam is produced. The transfer of heat to the cables is heavily reduced. The foam prevents the supply of oxygen to the fire at the source of ignition - fire transfer and the resulting flashover do not take place. The gases containing halogens produced when cable coatings and plastics burn are minimised by the development of foam. The consequential costs of fire due to corrosion and addressing poisonous substances are significantly reduced. Due to the simple handling of the textile, cable trays and cable racks can be simply protected, even when installed. With the Hapuflam® mounting clips, the Hapuflam® fire protection textile can also easily be mounted too difficult to reach areas without special tools. These mounting clips can be opened and closed again any time for subsequent assembly. Your technical personnel can also receive specialist customer verification from us. This means you can carry out the protective measures at your own discretion.